He was born in Ljubljana, Slovenia (then part of SFR Yugoslavia). He received a Doctor of Arts in Philosophy from the University of Ljubljana and studied psychoanalysis at the University of Paris VIII with Jacques-Alain Miller and François Regnault. In 1990 he was a candidate with the party Liberal Democracy of Slovenia for Presidency of the Republic of Slovenia (an auxiliary institution, abolished in 1992). Since 2005, Žižek has been a member of the Slovenian Academy of Sciences and Arts. In an interview with the Spanish newspaper El País he jokingly described himself as an « orthodox Lacanian Stalinist ». In an interview with Amy Goodman on Democracy Now! he described himself as a « Marxist » and a « Communist. Where are we today and what is to be done? Slavoj Zizek ponders these questions in this unique and timely book. 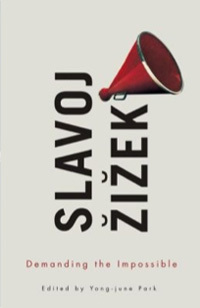 Based on live interviews, the book captures Zizek at his irrepressible best, elucidating such topics as the uprisings of the Arab Spring, the global financial crisis, populism in Latin America, the rise of China and even the riddle of North Korea. Zizek dazzles readers with his analyses of Hollywood films, Venezuelan police reports, Swedish crime fiction and much else. Wherever the conversation turns, his energetic mind illuminates unexpected horizons. While analyzing our present predicaments, Zizek also explores possibilities for change. What sort of society is worth striving for? Why is it difficult to imagine alternative social and political arrangements? What are the bases for hope? A key obligation in our troubled times, argues Zizek, is to dare to ask fundamental questions: we must reflect and theorize anew, and always be prepared to rethink and redefine the limits of the possible. These original and compelling conversations, many appearing here for the first time in English, offer an engaging and accessible introduction to one of the most important thinkers of our time.